Rounding numbers always seems to be a challenge for many of my students each year. We create anchor charts, practice, and play games until they finally start to get it. 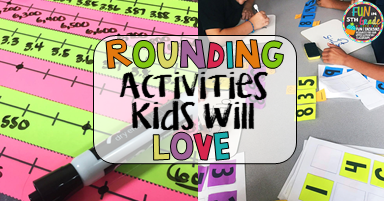 Today I’m going to talk to you about a few of the activities we did to review rounding. We were working with whole numbers but these activities could be modified easily for decimals, too! First I introduce rounding using a Flocabulary song. (paid subscription but so worth it!) This opens discussion up about numbers lines and how they they can help and what it rounding actually is. 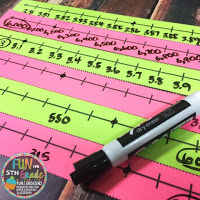 We talk about how the number line can help us figure out whether to round up or keep the place we’re rounding to the same. We discuss situations where rounding would come in handy and why we do it. Then we get together to make our anchor chart. We create the anchor chart together and highlight the steps that we use to round ANY number. We color coded the examples so they match the step. That made it easier for the students to find which part of the example went with each step. My struggling students are able to access the poster as needed while those that don’t need it work on. It’s especially helpful for my special education students as there are a lot of steps to remember and this can sometimes be difficult for them. 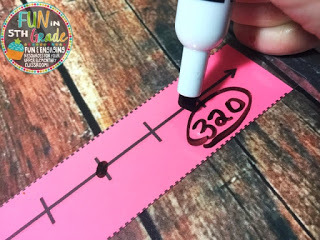 Then, I gave each student a laminated blank number line (get your freebie here) and a dry erase marker. We started practicing with those. I would write a number on the board that they needed to round. They would write the two options for rounding at either end of their number line. Then, they would plot their given number on their number line. After that, we would decide which number it was closest to. Then, we would take notice of the digit to the right of the place we were rounding to. 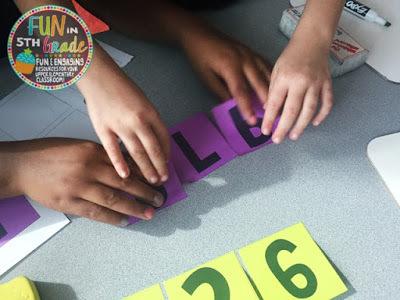 Students would then circle their answer on their number line. We did a few together and then the students were on their own to practice a few more. 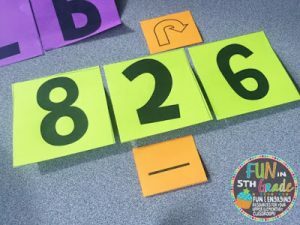 I think this activity really helped the students to see visually which end of the number line their number was closest to and what rounding actually is. 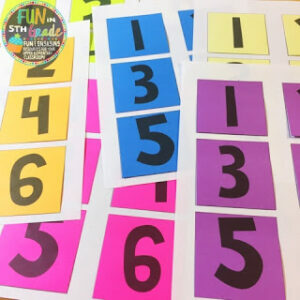 I printed these numbers on Post Its for my next rounding activity by using this free template that I made for you. It’s SO easy. Just print a few of the blank templates. Then, type in your numbers however you’d like. Then attach Post Its to your template and then print again. I even printed onto the small Post Its too. I put an arrow and an underline so students could use them in the activity. Bonus, the students LOVE playing with Post Its. Let’s be real…I love printing and playing with Post Its, too! Now, for the activity, I put the students into pairs and gave each pair a set of numbers, an underline Post It, and an arrow Post It. I told them to make a 3 digit number with their Post Its. They gladly did. Then I had them take their underline post it and put it under the tens place. After that, I had them take their arrows and point them at the number to the right of the underlined number. Once they had that done, they rounded their numbers to the nearest 10 on their white boards. Once they had a correct answer I had them make more numbers and round to different places. The more they got their answers correct, the bigger I had them make their numbers. 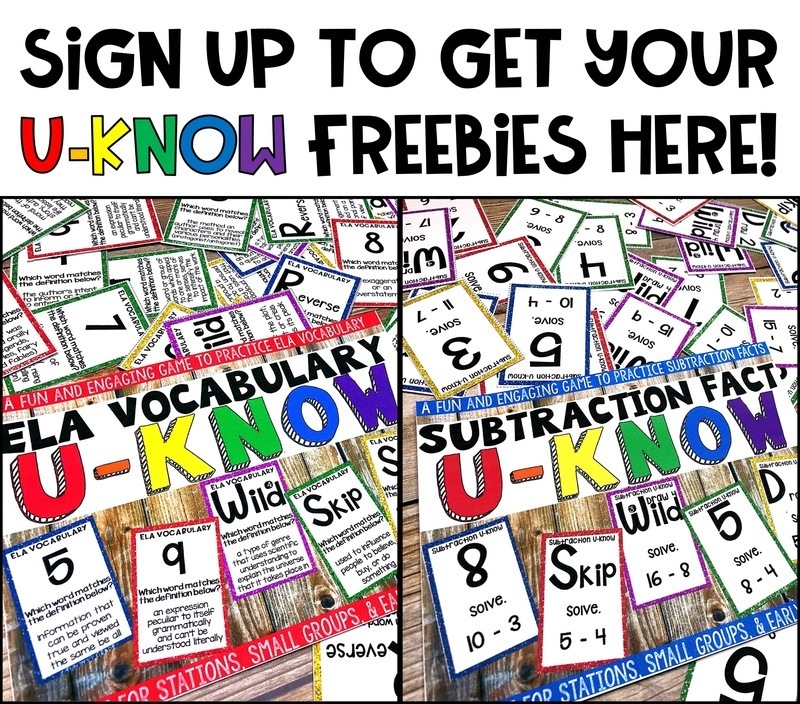 This worked great for differentiation since some students really seemed to get it while others were on the struggle bus. So I has those students creating 3 or 4 digit numbers while other were creating 5 or 6 digit numbers. 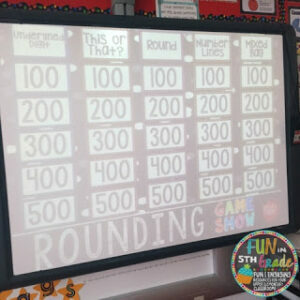 The last activity that we did was to play the Rounding Game Show! 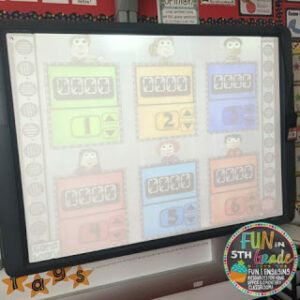 Students worked with their groups and we were rounding machines. They were so engaged and motivated by the game, that they were trying their best to get the points for their team. The variety of question types helps them to be exposed to rounding in many different ways. The question even get more difficult the higher the point value. Students are broken up into no more than six teams. Teams take turns picking the category and point amount. Everyone solves EVERY problem. If at least 50% or more of their team gets it correct, they get the points. If not, they get nothing. I don’t take points away and everyone has a chance to earn points on every question. I like it this way because then all students are practicing the entire time instead of just the team who picked the question. Find my Rounding Game Show here. I also have a Decimal Version of the Rounding Game Show as well. Click here to see that. 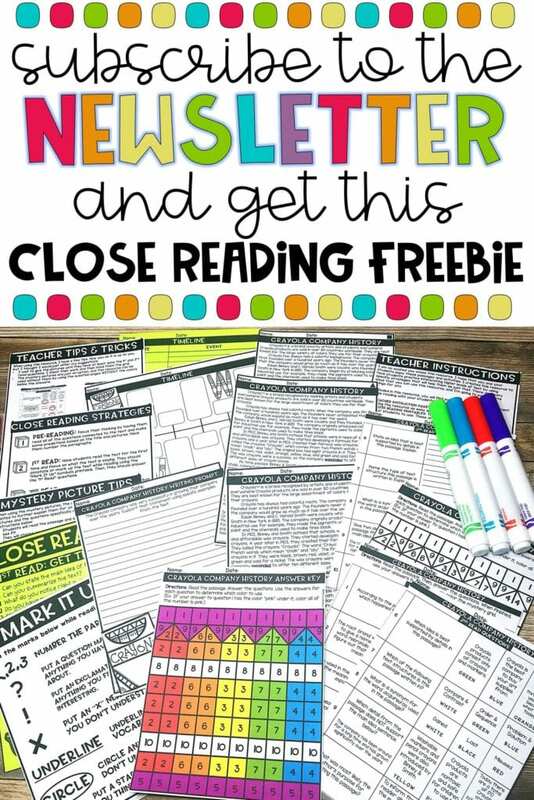 You can find this game and all of my other rounding activities in my Teachers Pay Teachers store. 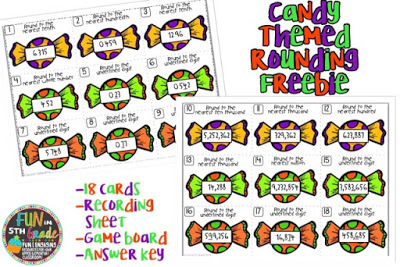 I have rounding task cards, a Rounding U-Know Game, and a Rounding Halloween FREEBIE. 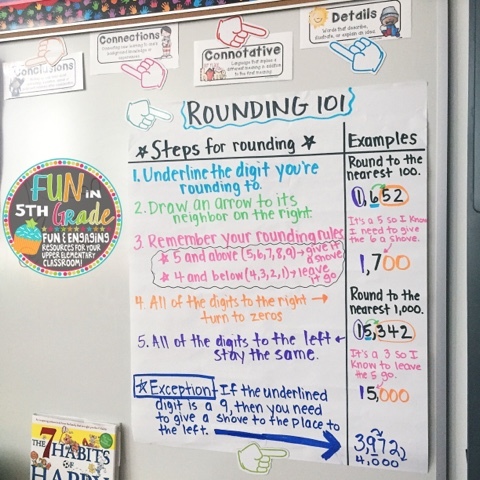 Hope these activities help your students grasp the concept of rounding. 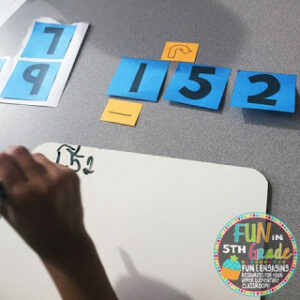 If you have any other super fun rounding activities, please share them in the comments below.